Blending Thai hospitality and stylish décor, the award-winning 5-star Pathumwan Princess Hotel is located right next to MBK Shopping Center and across from Siam Square. It offers 5 dining options, an outdoor pool and a tennis court. Princess Pathumwan is 15 miles from Suvarnabhumi Airport. 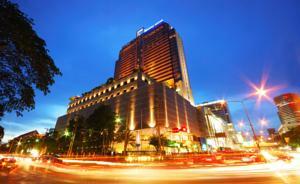 The hotel is a short 5 minute walk from Siam BTS Skytrain Station. With beautiful dark hardwood floors, spacious rooms at Pathumwan Princess have floor-to-ceiling windows with panoramic views of the Bangkok skyline. Each comes with a flat-screen cable/satellite TV and modern glass bathrooms. Tantara Health Spa features relaxing massage treatments and meditation rooms. Rooftop tennis courts and a jogging track are available at The Olympic Club Fitness Center. Dining options at Pathumwan Princess include Italian, Korean, European and Thai dishes. Sandwiches and coffee are available at T@Lobby Café. Studio Bar offers jazz music and cocktails. Wi-Fi is available in public areas and charges apply. Free! All children under 4 years stay free of charge when using existing beds. Free! One child under 2 years stays free of charge in a baby beds. One older child or adult is charged THB 2354 per person per night in an extra bed. The maximum number of extra beds/baby beds in a room is 1. Additional fees are not calculated automatically in the total cost and will have to be paid for separately during your stay. American Express, Visa, Euro/Mastercard, JCB The hotel reserves the right to pre-authorize credit cards prior to arrival.